Last week I had a little get together so I had to spoil my guests to a sweet treat. 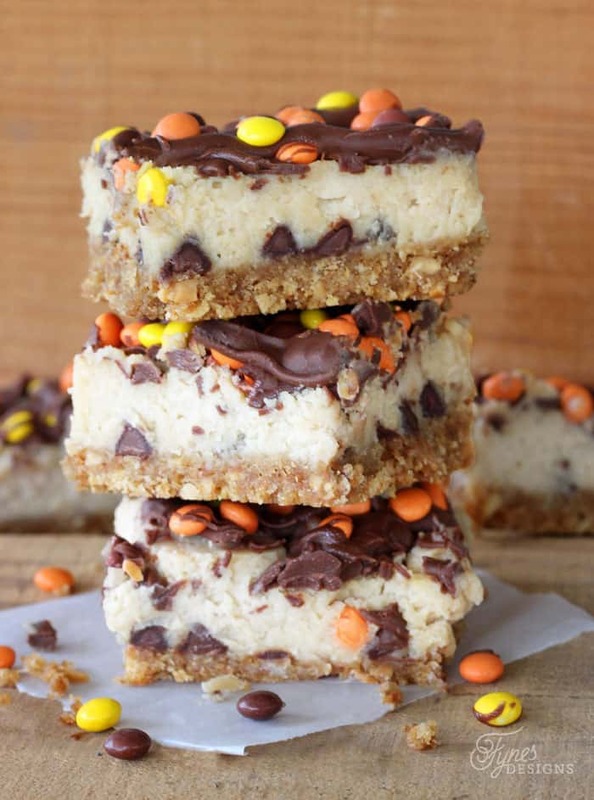 I did’t hesitate one second to pull out these delicious Peanut Butter Cheesecake Bars. I can’t resist anything with peanut butter, throw in a little chocolate and I’m instantly sold! I have to be honest, most cheesecake recipes make me feel a bit intimidated. Who wants to waste all those great ingredients if you mess up? Well this Peanut Butter Chocolate Cheesecake Recipe is a super easy cheesecake recipe, if you do get cracks in the top, the chocolaty candy topping is sure to disguise! Line a 9x13 pan with parchment paper, so that parchment extends over the edges of the pan. Bake crust for 8-10 minutes. After crust bakes, remove from oven and immediately sprinkle on 1 cup of milk chocolate chocolate chips. While crust bakes, prepare filling. With a beater, cream together cream cheese, peanut butter, sugar, flour and vanilla on medium speed until smooth and creamy. Add the eggs one at a time, mixing well and scraping the sides down after each addition. Slowly pour in the milk and beat until combined. Do not over mix. Pour the cheesecake batter over the chocolate chips and bake for 35-40 minutes, or until the cheesecake layer is set around the edges and still appears slightly soft when the pan is wiggled. Allow the cheesecake to cool completely in the pan set on a wire rack. Allow cheesecake to cool for about hour, then place in refrigerator to chill at least 4 hours, or overnight. When ready to serve, place remaining chocolate chips in a glass bowl and melt in the microwave for 1 minute, stirring until smooth. 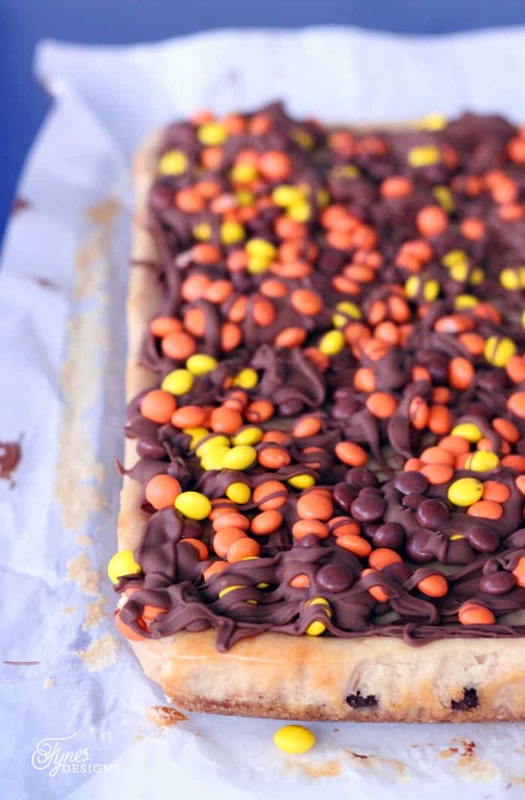 Drizzle chocolate over the cheesecake and sprinkle with the Reese's Pieces. Return to fridge for a few minutes until chocolate has hardened. When ready to serve, remove cheesecake from pan using parchment paper cut into bars and place on serving platter fro guests to enjoy! Lining the pan with parchment paper, makes it super easy to get them out of the pan. Just cut and serve! You’ll want to use a sharp knife to cut through chocolate topping. 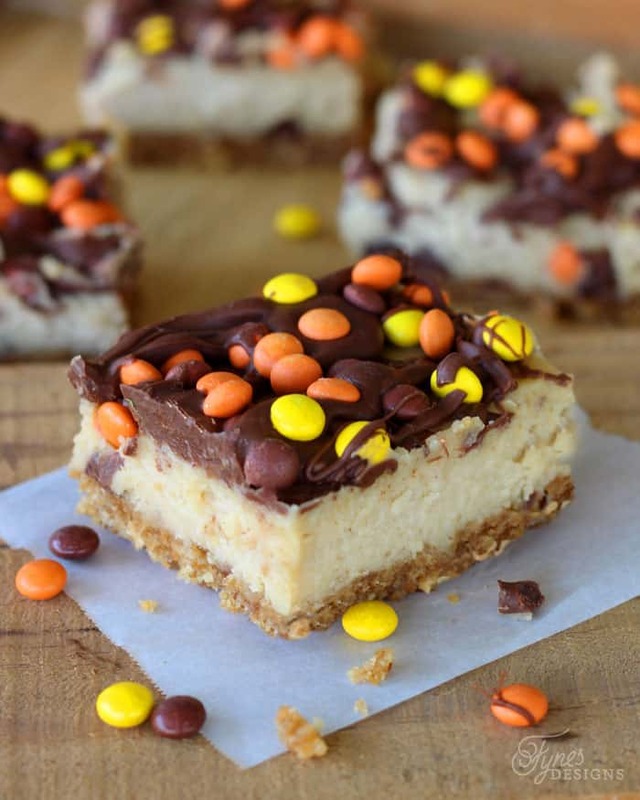 These easy to make Peanut Butter Cheesecake Bars will have your company begging for the recipe! Wouldn’t they be perfect for a Halloween party?! Enjoy, and have a fabulous weekend! Yummy! And I love your photo! YUM! these sound (and look) divine!! Thanks Trish, they are kinda delicious if I say so myself! Those look incredible! Thank you so much for linking up at Tasty Tuesday! Your recipe has been pinned to the Tasty Tuesday Pinterest board! Please join us again this week! These look great! However, is there any other nut I can substitute for pecan(allergies)? I hope all you church friends love them! Thanks for stopping in! Sorry, I’m not familiar enough with gluten free products, but I’m sure you could find a similar recipe.